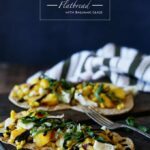 This post for Grilled Peach, Corn, and Basil Flatbread with Balsamic Glaze is sponsored by Flatout Bread. As always, all opinions and recipe are my own. Thanks for supporting the brands that support Shared Appetite! 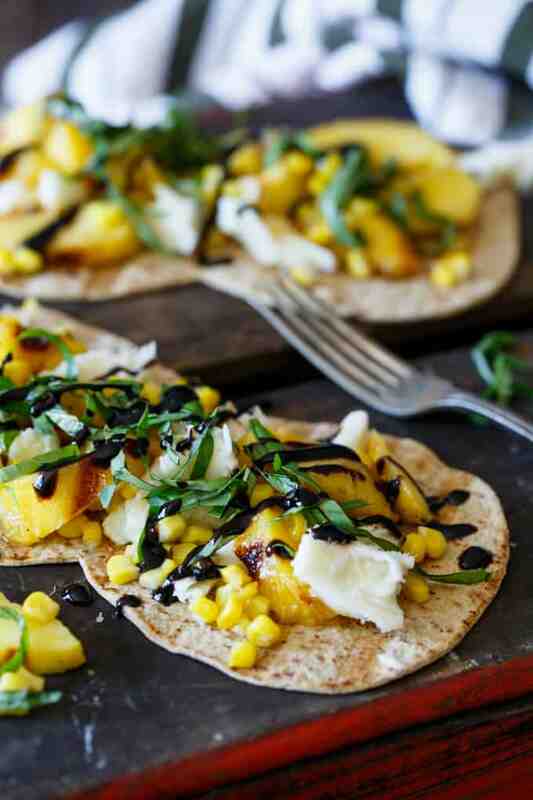 Brighten up your summer eating with this healthy Grilled Peach, Corn, and Basil Flatbread with Balsamic Glaze! There are just 7 school days standing between me and summer vacation. Just 7 days before turning that morning wake-up alarm off and enjoying the sole responsibility of relaxing all day, every day. Oh wait… that’s right. Baby Olivia is due to arrive in just over a week. Looks like I’ll be waking up to a different kind of alarm clock this summer. And will be enjoying my summer relaxation time in a very different way. But one thing that I won’t comprise on this summer… flavor. I wait all year long for these few months of fresh produce overload. When fruit bursts with juicy goodness. When I just need to take a few steps outside to grab some fresh herbs from our patio planters. Ah, summer. You are awesome. Especially when you give me legit eats like this Grilled Peach, Corn, and Basil Flatbread with Balsamic Glaze. Heck to the yes. Guys. Grilled peaches? You need them in your life. Seriously. Throw ’em in salads. Or in a bowl with some vanilla ice cream. Or make one heck of a variation of the classic caprese salad… grilled peaches, fresh corn and basil, mozzarella, and balsamic glaze. Put that all on a flatbread, and you have yourself some good summer eats. So can I be honest? With our baby on the way, I’ve gained quite a bit of pregnancy “sympathy weight”. Not good. The button on my jeans is currently holding on for dear life. I’m making it my mission to start eating healthier now that summer is here, so I was super happy to try out Flatout Bread Hungry Girl Foldits… even if I’m a Hungry Guy. They come in 100% Whole Wheat with Flax, Traditional White, and Rosemary + Olive Oil. Best part? All are 100 calories or less, are low in fat, and are a good source of fiber. 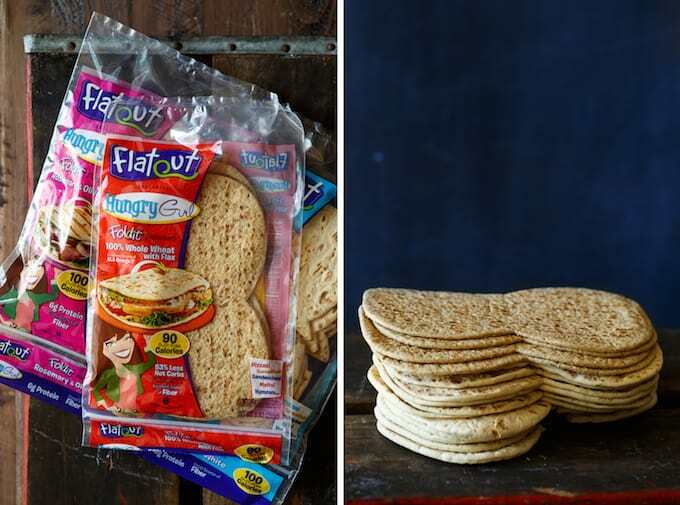 Of course, the Hungry Girl Foldits are perfect for burgers and sandwiches, but they also make for one super easy pizza or creative flatbread! 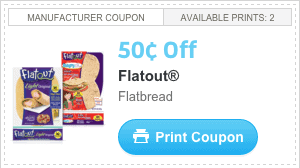 Grab a coupon for Flatout Bread Hungry Girl Foldits! 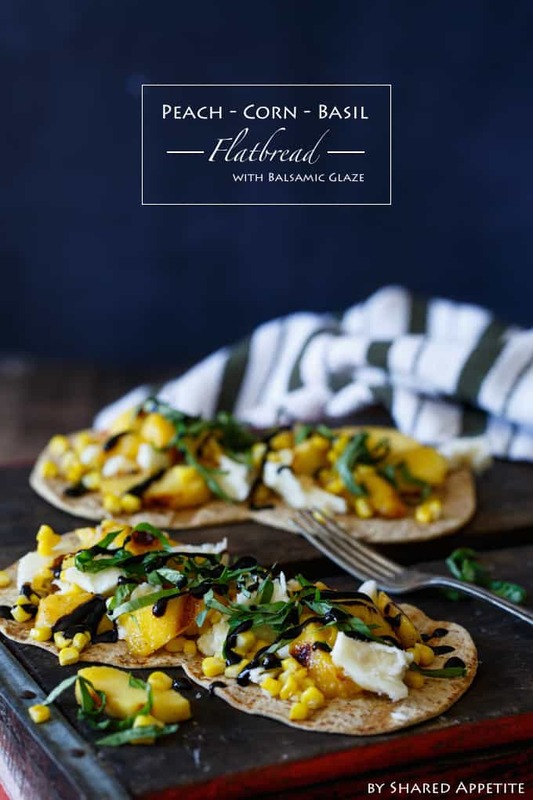 Brighten up your summer eating with this healthy Peach, Corn, and Basil Flatbread with Balsamic Glaze! Heat 1 tablespoon of olive oil in a small saute pan. Add corn kernels and season generously with Kosher salt. Cook until tender, about 5-6 minutes, stirring occasionally. Remove from heat and set aside. Preheat grill over medium-high heat. Brush peaches lijghtly with olive oil. Grill peaches approximately 2 minutes per side, until char marks appear. Remove from grill and slice. Add flatbreads to grill and toast for 30 seconds to 1 minute per side. Stack basil leaves on top of one another and gently roll them into a cigar. Slice into thin ribbons, creating a chiffonade of basil. 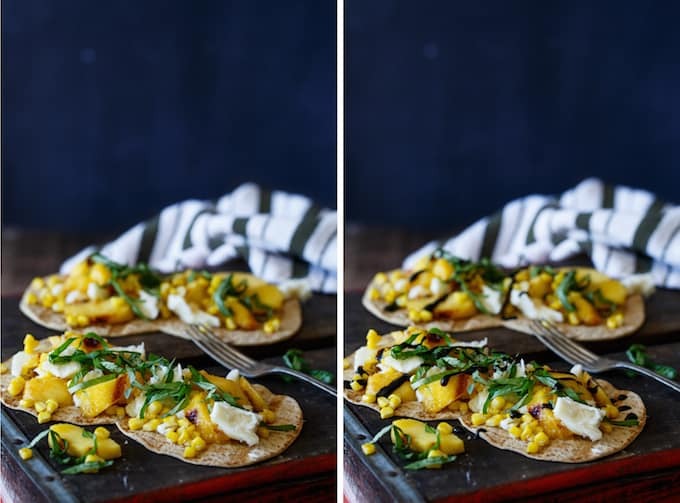 Top flatbreads with grilled peaches, corn, basil, and mozzarella. Drizzle lightly with olive oil and balsamic glaze. Devour immediately. Want a rad coupon? Click on the image below! I love the sound of the peach with the corn! These flatbreads sound completely delicious! These photos are beyond stunning! I love the fresh sweet corn and peaches with the basil 🙂 Pinning! THIS is what summer looks like! These flat breads are absolutely my kind of thing. So simple and yet what a wonderful combination of ingredients you’ve got on there. I love summer for this! Awesome dish Chris! I love using the fresh tastes of summer to make a good meal. This looks perfect! So delish! I love fruit with savory stuff! I love grilled peaches, grilled corn, grilled everything! What a nice summery meal!